Hyundai has unveiled the new generation of the Santa Fe SUV ahead of the Geneva Autoshow and it’s safer than before. The Hyundai Santa Fe is their biggest SUV they have on the market ( might soon change based on new spy pictures). 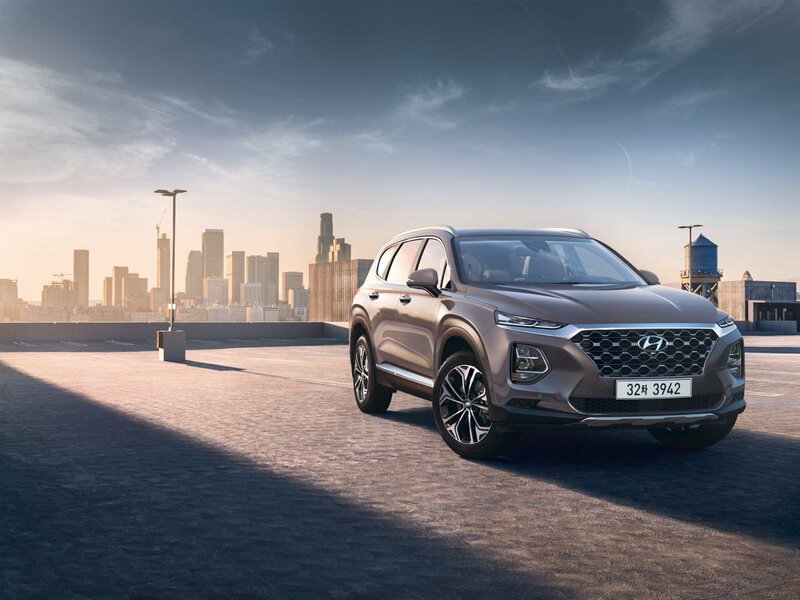 This is the Fourth generation and brings a lot of new things from the exterior and interior design to flow with the Hyundai SUV’s new design lines, hopefully helping the small decline on sales of the Santa Fe. The Exterior design is based on Hyundai’s new SUV design like the models Kona and Nexo. The Turn signal and DRL on the top and the headlight at the bottom, it has 2 projectors inside making it much taller compare to the Kona which is wider with only 1 projector and it appears the fog light are down below. In between the headlights the same Hexagonal grill from the Kona but with a much bigger Honeycomb patter. On Korea The Santa Fe will come with 2 Diesel and one Gasoline engine. The first option will be the 2.0 CRDI Diesel with 148 HP and 183HP as well as the 2.2L CRDI with 200 HP, the Gasoline engine will be the 2.0L Theta II Turbo with 264 HP. The Diesel 2.0 Engine will start at 29.25 million Won ( approximately 26,600 US Dollars, The 2.2L Diesel engine will start at 34.4 million Won ( approximately 31,300 US Dollars) and the 2.0L Turbo starts at 28.45 million Won (approximately 25,800 US Dollars). The interior is also a complete new design for the Santa Fe, its almost identical to the Kona model but with some futuristic designs like the Nexo model. The infotaiment system is a tablet like design, below the hexagonal A/C vents design and down below the A/C control unit. The infotainment system will also come with Apple carplay and Android Play. The new generation of the Santa Fe will come with more safety features such as Forward Collision Avoidance Assist (FCA), Forward Collision Warning (FCW), Lane Keeping Assist (LKA), Lane Departure Warning (LDW), Driver Attetion Warning (DAW), High Beam Assist (HBA), Rear Cross-Traffic Alert (RCCA),Advanced Driver Assistance System (ADAS). Additonally Hyundai is giving new safety features that are debuting on the Santa FE, Safe Exit Assist (SEA) and Rear Occupant Alert (ROA). SEA feature is an alarm sound when a passenger trys to exist the vehicle but a car is approaching from behind. ROA feature is an alert to the driver when there is rear passenger seat, this is focus to alert parent who accidentally leaves their children inside the car. The Santa Fe is now available for Pre-Order in South Korea and soon will hit Show rooms by February 21. For the North American Market, we can expect the new Santa Fe by this summer.